This game exercises your short-term memory and helps improve your memory for spatial locations. This is one of my favorite brain games! Help Lydia the Librarian quickly find books for the kids. The kids' word bubbles tell you which books they want. But the books aren't labeled, so you need to memorize the location of each book! If you like this game, you might enjoy the School Supply SNAP game which also trains short-term memory. HOW TO PLAY. Bring the books to the kids before they get upset and leave. Drop any unwanted books into the Return slot. You are Lydia the Lightning Librarian. Let's hope you can live up to your name. Your job is to provide students with the books they ask for. But it's not going to be easy. These students are impatient. They become angry and frustrated if you don't get the book to them quickly. And they'll leave in a huff if you take too long. If 5 students exit the library without a book, it's game over. Worse yet, the books in this library are not organized by subject, title, or card catalog number. The titles don't even appear on the side of the books. All you have to go on is your own memory. As the lightning librarian, you need to exhibit an excellent memory for the locations of the books. Otherwise, you'll waste a lot of time looking for the same book over and over. 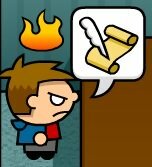 Use the arrow keys to guide Lydia among the library bookshelves. Press the Spacebar to look at a book or take it off the shelf. Fortunately for you, there are only 15 books in this library. The type of book is indicated by the image on the cover of the book. For example, the book about Computers has an image of a computer on the cover. To see the cover, stand next to the book and press the Spacebar. If the book you select is the one the student has asked for, you'll pull it from the shelf. If it's the wrong book, you'll see the book cover briefly then it will return to the shelf automatically. As a further hint, each type of book is assigned a random color for the duration of the game. Books on the shelves are grouped in sets of 4 by color. There is a set of 4 red books, a set of 4 blue books, and so on. A good strategy in Lightning Librarian is to associate the color group with the image of the book. For instance, if the color of the Sports books is blue, imagine a football team wearing blue uniforms. If the Construction book is light blue, imagine the dump truck full of light blue stuff. RETURNS. If you pull the correct book for a student but the student leaves before you can give the book to them, drop the book in the Returns slot along the top wall. 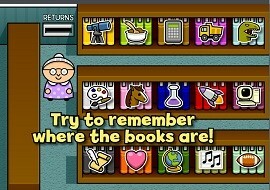 Lightning Librarian is one of the most effective free memory games on this site. Master this game, and you'll be able to quickly remember the locations of up to 15 hidden objects with ease. Even if you are frustrated at first and can't seem to memorize the location of the books, be persistent anyway. Keep at it, and your brain may surprise you! My high score with this game is 14,300. See if you can beat that. Game distributed by FreeGames14.com. Used with Permission.